The Tesla Powerwall 2 is one of the most advanced residential energy storage systems in the world and it all starts with the batteries. The leadership highlights the fact that Tesla is not only a carmaker but also a major battery company that sells its batteries in a variety of form factors, including cars like the Model 3 and stationary energy products like the Powerwall. The Powerwall 2 is, at its core, a DC Battery system with a usable capacity of 13.5 kilowatt-hours that can be extracted at a 7kW peak or 5kW continuous rate. Most homes run on AC power, though, so Tesla has stacked an inverter on top of the battery pack that turns stored DC power from the battery into AC power that all of the appliances and gadgets in the house can use. Conversely, when it comes times to charge, the inverter can turn AC power back into DC power that is stored in the battery. This inverter has a round trip efficiency of 90%, meaning that 10% of the power sent into the Powerwall to be stored is lost by the time it gets back out in the inefficiencies of converting the power from AC to DC (going into the Powerwall) and from stored DC power back to usable AC power. Batteries are commonly rated, compared, and discussed based on their usable capacity, as listed in kilowatt-hours (kWh). Unfortunately, the world of storage capacities is not a straightforward one, with some manufacturers listing the total capacity of the battery cells in the unit even though some of it might be reserved to protect the life of the battery. Tesla lists the capacity of its Powerwall 2 units in terms of usable capacity, which is the total amount of energy stored in the battery that can actually be pulled back out and used by the attached home or business. It features a 100% depth of discharge, meaning that the entire 13.5 kWh of usable capacity can be pulled out, if needed. On the pricing side of things, the Tesla Powerwall 2 tips the scales at $6,700 per Powerwall retail and another $1,100 for the Powerwall Backup Gateway 2. That covers the hardware, while installation ranges from $1,000 to $3,000, depending on the complexity of the installation. For example, if a Powerwall is installed in conjunction with a rooftop solar system, the cost will be lower, as the electrician will already be onsite to do the wiring required for the solar panels. A variety of rebates are offered by governments and utilities around the world that make the Tesla Powerwall more affordable. Local electricity rates, residential energy storage regulations and pricing schemes also impact the payback on a Powerwall installation, so some work may be needed to help price out the unit. Though, in our experience, Tesla’s sales team knows these numbers like the back of their hands and can provide helpful insights into local markets. The Powerwall 2 was recently updated with a new Gateway, dubbed the Backup Gateway 2, which has allowed Tesla to largely standardize the way Powerwall operates around the world. The new Gateway was rolled out as part of a larger standardization effort across the Powerwall product line that also saw Tesla increasing the pricing on the base Powerwall 2 unit and some of the supporting products. The Tesla Powerwall 2 was designed to allow for flexible operations with over-the-air updates that can push new functionality down to the Powerwall. The internet connectivity of the Powerwall Backup Gateway 2 allows it to stay connected to the internet to keep tabs on changing electricity prices, energy policies, and even the weather. These data are rolled together into a package that is constantly working to optimize the energy footprint of the home using a handful of optimization features. Self-Powered — The Tesla Powerwall has the ability to maximize the self-consumption of an onsite solar system. This is accomplished by storing up power during the day and using that stored power as needed to power the home. Tesla estimates that the ability to store daytime solar generation and use it back from the battery at night roughly doubles the amount of solar energy that directly powers your home. Backup — As a residential battery, one of the primary functions of the Powerwall is to provide backup power in the event of a utility power outage. In the event that the outage lasts for an extended period, Powerwall can actually recharge itself from a rooftop solar power system. That capability means that while your neighbors might be without power for hours, days, or even weeks, a solar-connected Powerwall system can effectively keep your home powered indefinitely, within the constraints of the size of the solar system and the number of Powerwalls installed, of course. Advanced Time-Based Control — Powerwall is connected to the internet and has brains to match, which work together to optimize the cost of energy for customers with electricity rates that vary depending on the time of day or the season. With Advanced Time-Based Control, Powerwall actively works to maximize the value of the solar generation and the energy usage of the home from the grid to intelligently charge and discharge based on the time and price of energy. When connected to an onsite solar power system, Advanced Time-Based Control can operate in either a balanced mode or a cost saving mode. Balanced mode prioritizes using stored solar power to power the home when electricity is expensive and after the sun goes down. Cost-saving mode, on the other hand, optimizes the storage and usage of electricity to make the overall usage profile of the home as low cost as possible, maximizing savings that come as a result of having residential energy storage. 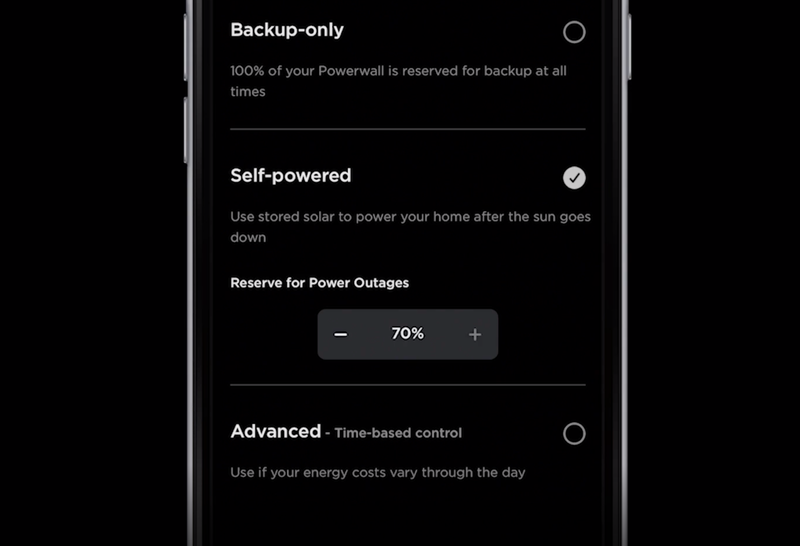 Head over to Tesla’s Powerwall with connected solar system page for all the juicy prioritization details. 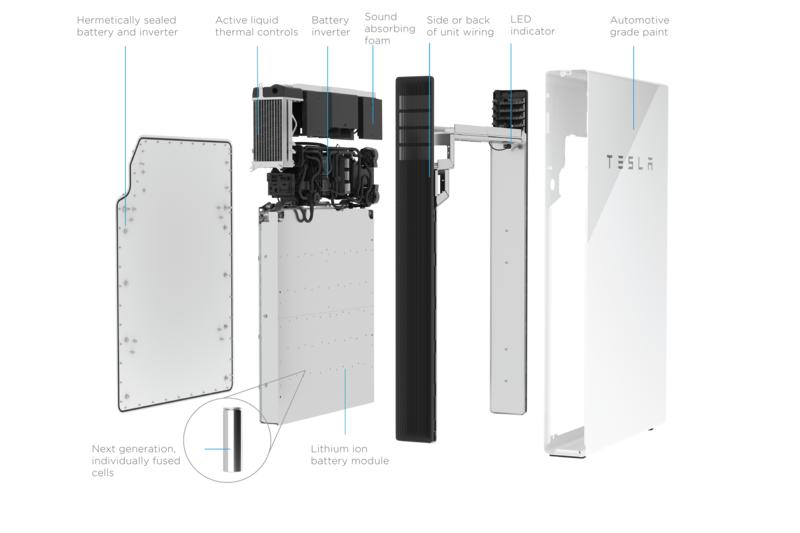 The Tesla Powerwall 2 has a handful of special modes of operation that solve for some of the more unique use cases. Those currently include Grid Services, Storm Watch, and Preconditioning, but more may be added with over-the-air updates in the future. Grid Services — Powerwall customers participating in Grid Services programs now know when their systems are benefiting the grid and can track Grid Services energy and power usage. Storm Watch — Storm Watch automatically detect incoming storms and prepare for them by keeping energy stored in the Powerwall. For Powerwall customers with backup and in selected regions, Tesla will automatically detect incoming storms and charge the Powerwall up completely to ensure power is available in the event of a weather-related grid outage. Preconditioning — The Tesla Powerwall 2 is the only residential battery system on the market today that offers a full liquid thermal management system, according to Tesla. That translates to a completely sealed, liquid coolant system that circulates the 2.3 L (2.4 quarts) of liquid coolant in Powerwall throughout the battery array to ensure they are operating at the ideal temperature. This integrated thermal management positions the Powerwall 2 uniquely in the market with its ability to operate at the widest range of temperatures compared to the competition, functioning from -4°F to 122°F. If temperatures drop below freezing, the Preconditioning feature of Powerwall slowly begins to warm the battery to enable improved operation of the unit and charging performance of the battery. This happens automatically as Powerwall detects temperature changes. On a daily cycle, Powerwall also begins to warm up the battery a few hours before sunrise after a cold night, in preparation for receiving a charge from the attached solar system. This ensures that it is able to soak in as much energy from the solar system when the sun comes up and the panels start cranking out power. Preconditioning can sometimes be seen on the Powerwall Power Flow screen in the app, which may show energy flowing to the Powerwall from solar and/or the grid. Tesla implemented this intelligent self-management of thermal loads to ensure that Powerwall 2 is always optimized to perform at its peak given the ambient conditions and anticipated conditions. Head over to the information page for the Powerwall’s special operating modes to learn more. 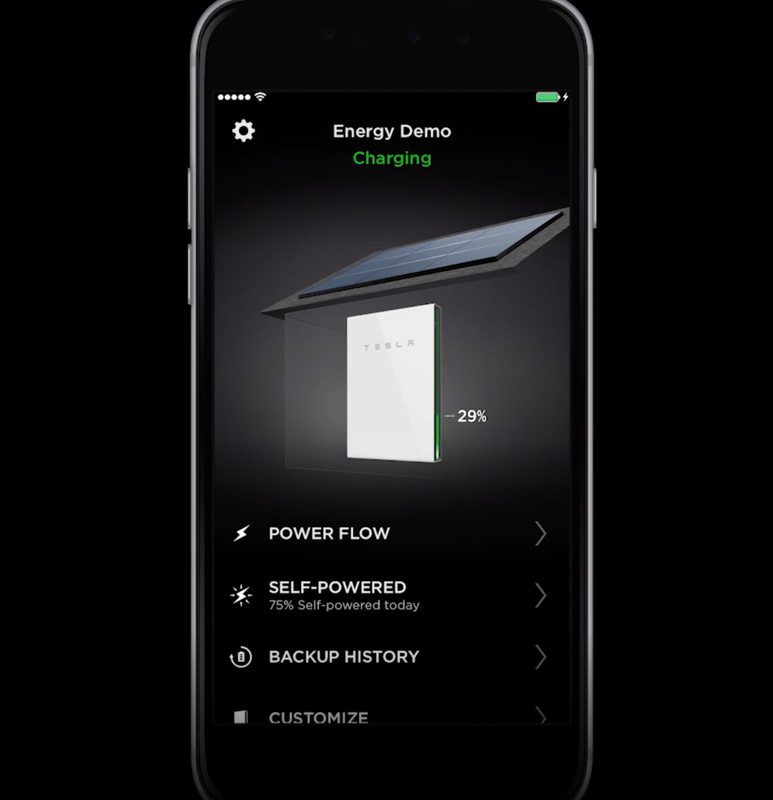 The Tesla Powerwall can be managed from the Tesla mobile app, which is available in the Android and iOS app stores. This is the same app that Tesla vehicle owners use to monitor their vehicles, check on the status of vehicle charging, and check or conduct other vehicle functions. After logging into your Tesla account in the app, you can see the current state of charge of the Powerwall and change Powerwall settings. On the energy side of things, the Tesla mobile app allows owners to monitor the energy flow between their rooftop solar systems, Powerwalls, the grid, and the energy usage of their homes. The realtime flow of energy is depicted with vivid graphics that make it easy to see where energy is flowing and how much is flowing. Owners can dive deeper into the data to pull up detailed graphs for each energy source that shed insights on where large periods of consumption or generation are occurring within each unit. These trends allow owners to see solar generation and Powerwall charging patterns in realtime, and also focus their attention on energy usage within the home. For Backup mode, the specific events that triggered the Powerwall to provide backup power can be seen along with the duration for each. In Backup Mode, 100% of the battery is reserved for backup power use, but in other modes, the percentage of the battery that is reserved for backup power can be customized based on the needs of the user. 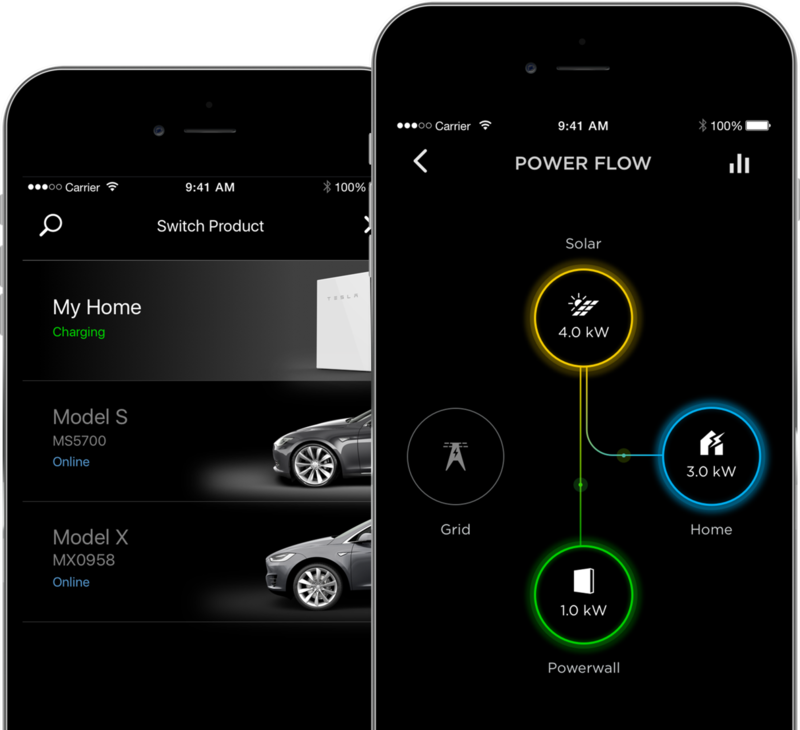 Tesla put together a video overview that walks through the core functions of its mobile app for Powerwall. It’s well worth the 6 minutes and change it takes to watch it if you’re in the market for a residential energy storage unit and/or a rooftop solar system. Overall, the Energy section of the Tesla app provides the ability for owners to dig into the details of system operation and even select the operating mode for their Tesla Energy systems. None of these tasks would be possible without internet connectivity, and it is the Powerwall Backup Gateway 2 that makes that possible. Gateway hardware for the Powerwall has historically been installed in a very plain grey utility-style box that leaves a lot to the imagination. 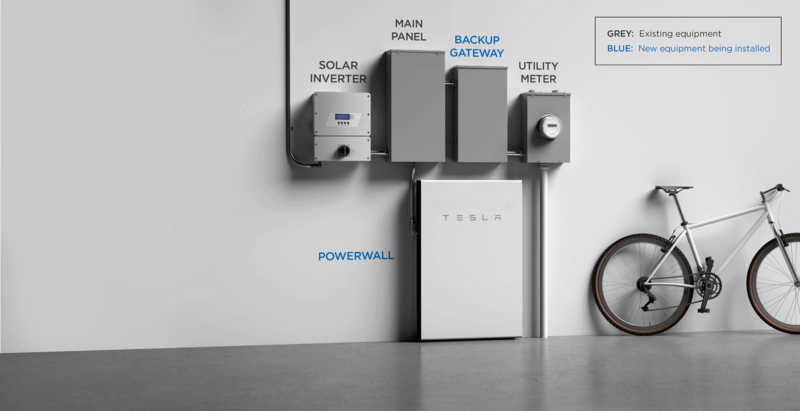 In 2019, Tesla will release an updated hardware set for the Powerwall Backup Gateway 2 that will bring it into the fold as an official member of the Tesla family, with a new Tesla-branded enclosure that will result in a much cleaner looking installation. 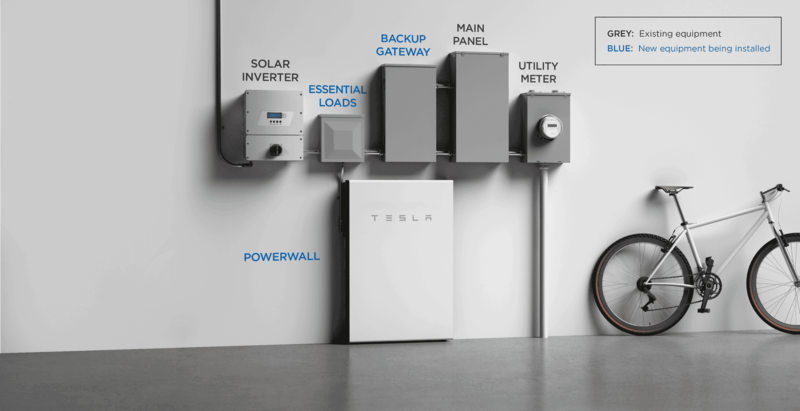 The refresh of the Backup Gateway shows just how critical it is to a Tesla Powerwall installation, and how important internet connectivity is to most of Tesla’s products as they strive to stay up to date and maximizing their benefit in the ever-changing landscape of electricity rates around the world. To learn more about the Powerwall Gateway, check out the product data sheet. 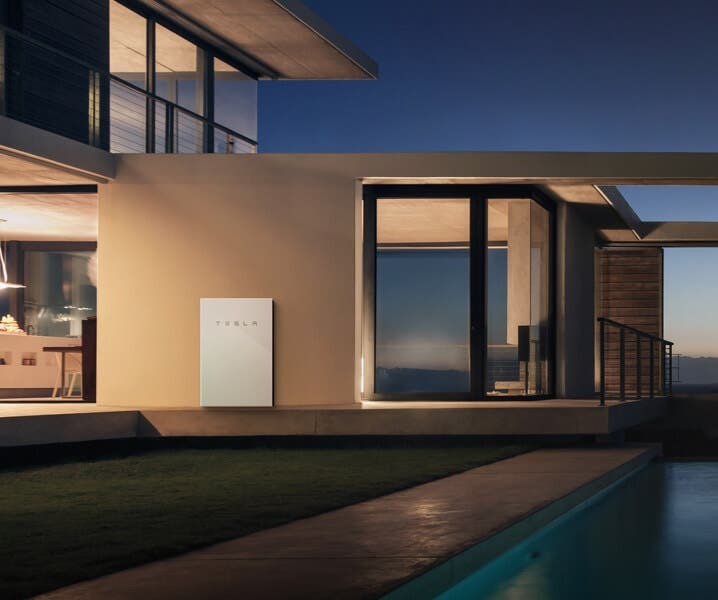 The Tesla Powerwall 2 is a powerful energy storage appliance on its own, but that power is scaled up with Tesla’s ability to bundle Powerwalls together virtually into larger energy storage units. Imagine, if you will, bundling the Powerwall energy storage of 100 homes together into a single virtual unit with a usable storage capacity of 1350 kWh, or 1.3 MWh. Tesla is doing this at a massive scale in South Australia, where it aims to connect tens of thousands of homes together as a distributed virtual power plant. This is the essence of what Tesla and others call a Virtual Power Plant (VPP), and Tesla is already doing this in production at a much, much larger scale than just 100 homes. In parallel to its blockbuster 129 GWh Powerpack installation, Tesla has partnered with the South Australian government on an initiative to install solar plus storage on a staggering 50,000 homes across the region to add yet another layer of distributed energy generation (DEG) and storage to the region. The distributed nature of the installations increases the resiliency of the entire grid and all but eliminates the possibility that a single failure can take down the grid. Further, distributed energy storage is located in closer proximity to the point of generation and use, reducing the amount of energy lost in distribution and transmission. Tesla’s Powerwall can be installed as a ground-mount installation or mounted to a wall, depending on what’s best for the location it’s being installed at. It is touch safe, meaning it does not need any special clearances nor does it come with any specific safety setbacks. The Powerwall is also water resistant and dust proof, making outdoor installations an option in most locations. Powerwall and Backup Gateway units are rated for installation indoors or outdoors, and can operate within a wide range of temperatures, from -20°C to 50°C (-4°F to 122°F), though the optimum temperatures for Powerwall operation are between 0°C and 30°C (32°F to 86°F). When it comes time for the actual installation, Tesla has outlined the process on its website, but look to an electrical professional to install it, as any type of incorrectly wired high-power devices can quickly result in a fire or other calamity. Have a look at the 2½ pages of warnings and safety notices in the Tesla AC Powerwall 2 Owner’s Guide for some of the specific risks beyond the obvious statements about not installing it areas that might flood. On that note, maybe a wall mount is the better option. A Tesla Powerwall 2 might look like a cute, modern appliance that fits right in with the latest Apple, Google, and Amazon gadgets that are listening to everything you do in your house are sprinkled around your home, but make no mistake, the Powerwall 2 is, at its core, a massive battery. Batteries are heavy and so is the Powerwall 2, tipping the scales at 122 kilograms (269 pounds). At just 155 mm (6.1 inches) thick, the Powerwall 2 is much heavier than it looks like it would be, thanks to the bulk of the volume being filled with batteries. Overall, the Powerwall 2 has a footprint of 1150 mm x 755 mm x 155 mm (45.3 in x 29.7 in x 6.1 in), making it slender enough to mount to a wall without being obtrusive, but large enough to pack in some serious storage capacity. On the wiring side, there are two primary configurations for how the Powerwall 2 is wired into the home. If the Powerwall 2 will only be used to provide backup power to essential loads in the home, a new sub-panel is required to connect the Powerwall 2 to the specific circuits in the home that will have power in the event of a grid outage, as depicted in the image below (new components in blue in both photos). On the other hand, when the Powerwall 2 is wired into the entire home to be used as a whole home backup solution, it is wired directly into the main electrical panel of the home. In this configuration, only the Powerwall(s) and the Backup Gateway are added — a new sub panel is not required. I don’t have my own Powerwall yet, but I’m in the middle of working on a new solar plus storage installation for the home that we are in the process of rebuilding. Moving towards a lower carbon, lower impact lifestyle with a home that runs everything on electricity, with no natural gas even plumbed in, feels like the future, and we’re thrilled to have the opportunity to take on the task, painful as it has been at times. Energy storage is a mandatory component of that future, as it helps keep our locally generated renewables in our home, putting less strain on the grid. 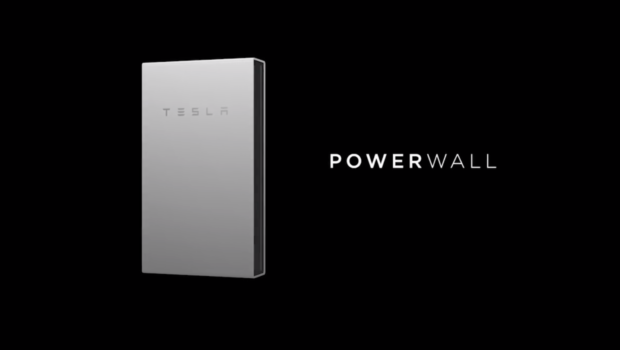 For the latest and greatest official info about the Tesla Powerwall, head over to the Powerwall website. If this article has helped you make a decision to purchase a Tesla Energy solar or solar + Powerwall system, you can also use our referral code to get an extended 5-year warranty on a new Tesla Solar system.